First make your starter: a small leavened mix. I make mine by mixing dry yeast (oldest versions of Pan de Muerto use Pulque, a fermented drink) with lukewarm milk, not too hot and not too cold, to make it easy for the yeast to react. Fully dissolve and add a bit of flour, to get the yeast going on stronger. When it puffs up and has bubbled on the surface, about 20 to 30 minutes later, you have your starter. 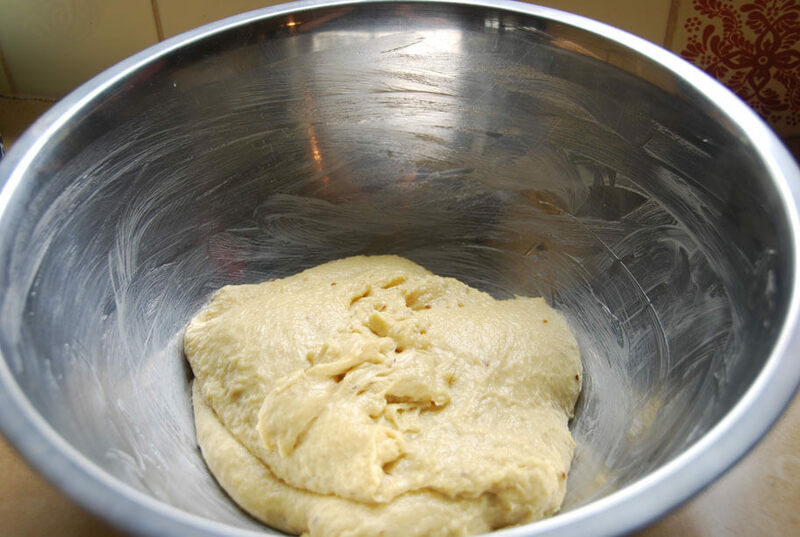 Then make your dough in the mixer with butter, sugar and eggs. I add orange blossom water, as is traditional in many parts of Mexico and the old fashioned way. It makes it fragrant and light. I also add a bit of orange zest and anise seeds, which perfume it even more. Once mixed, beat in the starter. Cover it and place it in a bowl. It’s better if you leave it in a warm area of your kitchen where there are no drafts, close to the oven or burners is a good idea, too. 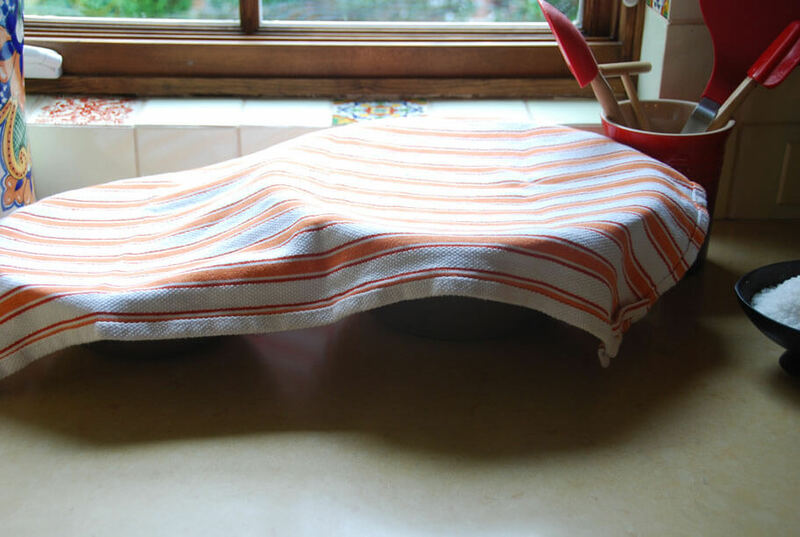 Leavened bread likes warmth and moisture, so much so, that I have gotten into the habit of placing a bowl with boiling water right next to the bowl with the dough and then cover it all together (in case you were wondering about the two bowls under the kitchen towel above). Then leave it to rise. See how it puffed up in photo above? Almost tripled its volume. Then punch it back down. Just like that, make some fists and punch it twice. 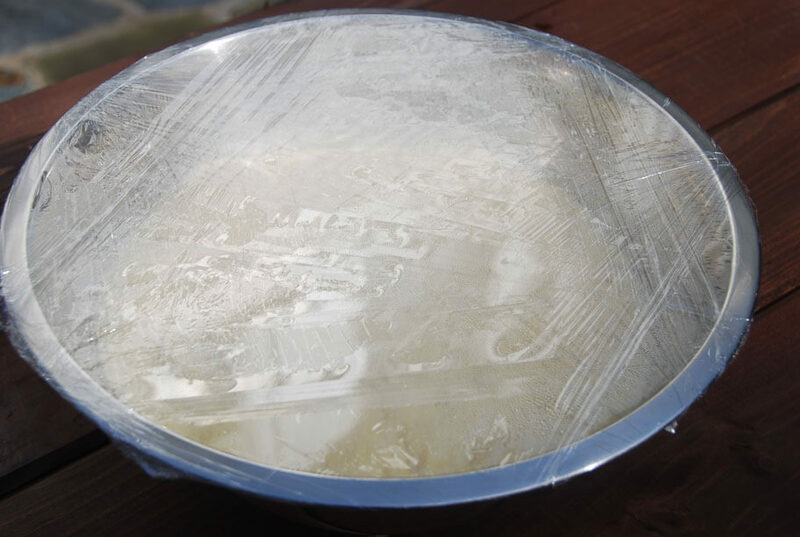 Cover it with plastic wrap and place it in the refrigerator so that it will slowly but surely rise again, overnight. 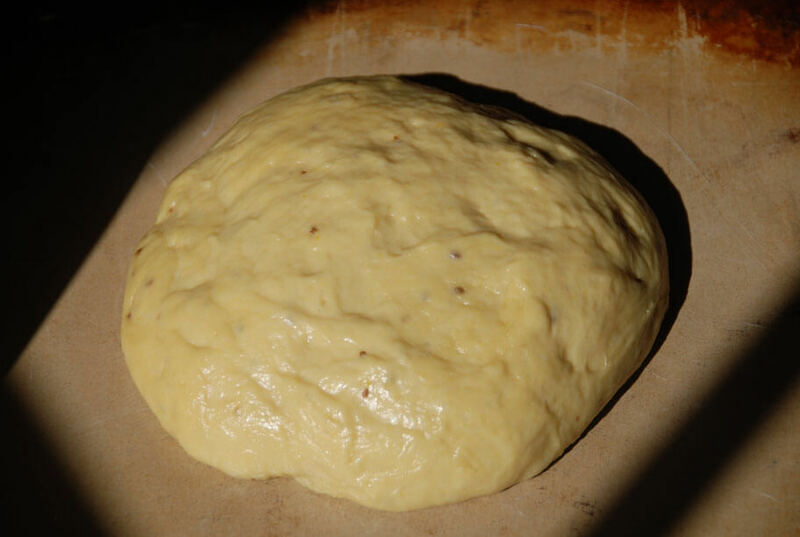 While you sleep, that dough will be getting ready for you. See below?? Look how it rose again! This time it was even bubblier and a bit stringy. This is the third rise. Next day, morning sun. 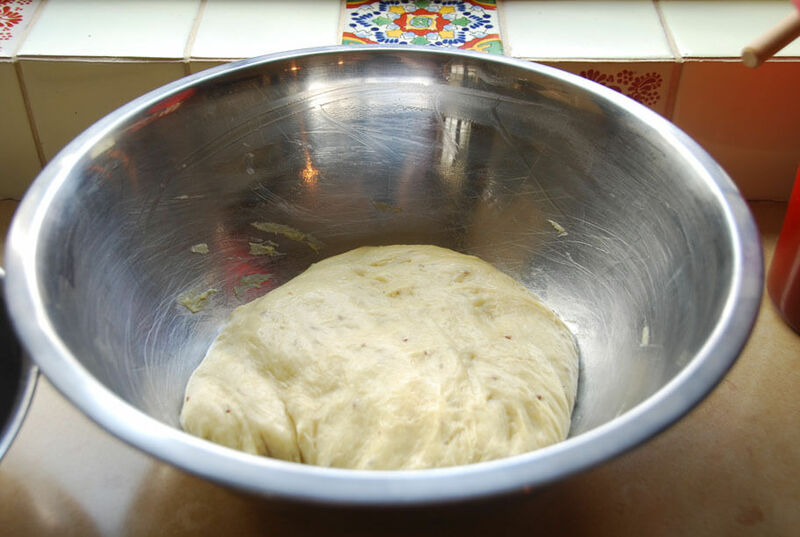 Then as you gather it into a ball, it will deflate in size, but you can see below how the dough has transformed and strands of dough are trying to stick to the bowl. Grab two thirds to shape like a ball and place it over a buttered or oiled surface. I like using this pizza stone. You leave a third of the dough apart, to decorate the ball with a couple of ropes and a ball on top. And then.. you cover it and let it rise again under a towel. And so it rose, under the towel! In the oven it goes. Lastly, when it comes out, it is entirely brushed with melted butter and covered in sugar. Some people add more complex decorations, like colored sugar or make intricate shapes. I like it straightforward with plain granulated white sugar and a round shape. 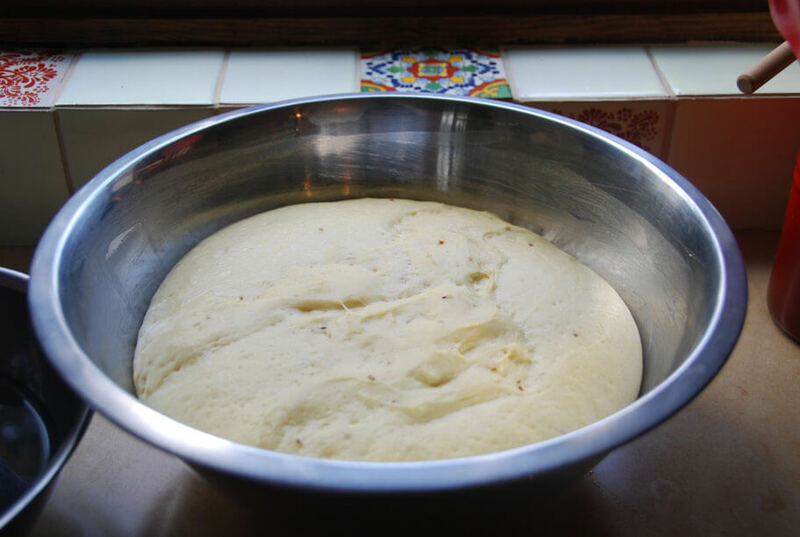 By mid morning the next day, you will have a Pan de Muerto ready to slice. 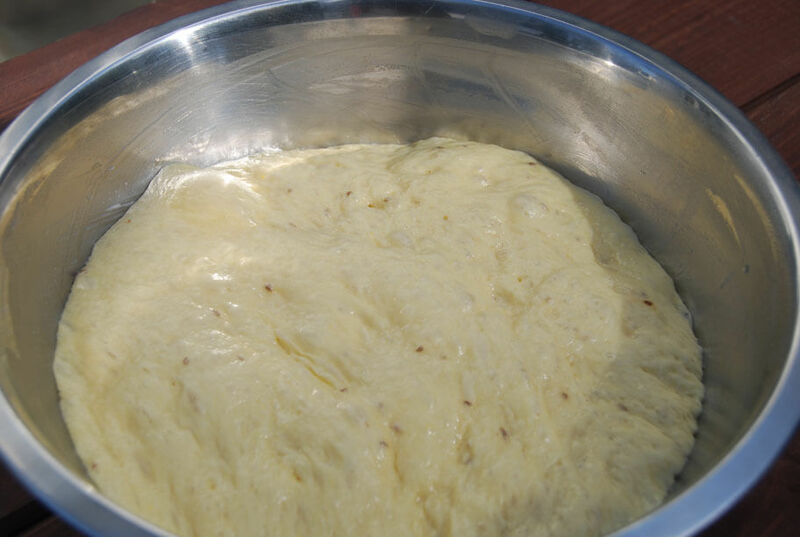 To make the starter: In a small bowl, pour the lukewarm milk - making sure that it is not hot nor cold or the yeast will not react - and stir in the dry yeast granules. Give the yeast a couple minutes to sit in the liquid, and stir with a spatula until it is thoroughly and evenly dissolved. Give it time: stir a little, pressing gently on the yeast that has not yet dissolved with the spatula, give it a bit more time to sit in the milk, stirring again, press again. Once it has completely and evenly dissolved, add ½ cup flour. Mix it combining thoroughly, until it has no lumps. It will be gooey, runny and sticky. Leave it in the warmest area of your kitchen, for about 20 to 30 minutes, until it puffs up (to about doubles or triples its volume) and has bubbled on top. I like to place a sauce pan or cup with boiling hot water right next to it, but it's not necessary. Preheat the oven to 350. Bake the bread for for about 35 minutes. Halfway through baking, after about 20 minutes, cover the loaf with parchment paper or aluminum foil to prevent it from browning too much. When they are ready, they sound "huecas", or hollow, if you hit the bottom of the bread. So happy to hear this, Marissa. Thank you so much. Pati Pati Pati. No se que hice pero me salió grandísima pieza de pan. Estaba entre la receta y una película que le gustaban a mi papá. Cuando mira la tremenda pieza empecé a reírme tan fuerte que hasta me salieron lagrimas. Me acorde de mi apá y como nos hacía burla porque siempre nos comíamos el pan dulce en tan solo minutos. El pan me salió un poco fodongo pero delicioso. Lol. Seriously though, thank you sharing the recipes of our Mexico querido ya que esas no hacen recordar esos lindos recuerdos de familia. Bravo! Gracias por compartir tus recuerdos conmigo, Maira. Yo como mi pan dulce en minutos también. I made your pan de muertos and followed the recipe as written. However, my bread came out tasting quite sour. Is this how it is supposed to taste? The proofing went very well, the color on the bread is lovely, but, well, the taste … surprised me. Oh no, I’m sorry to hear that it came out bitter, Helen. It might have been the yeast you used, sometimes the packages are very old. Hola Pati, I love your program on PBS and watch it here in Tijuana every Saturday. I am going to go look for the Orange Blossom water and Anise seeds here at the local market Hidalgo…how do I ask in Spanish for those two items? Thank you! Thank you so much, Robin! When you are at the market you can say: Estoy buscando agua de azahar y semillas de anís. Or you can ask ¿Tienes agua de azahar o semillas de anís? What a lovely way to celebrate loved ones. Yes, a great way to remember everyone, Shashi. Any suggestion on how to make this without eggs? 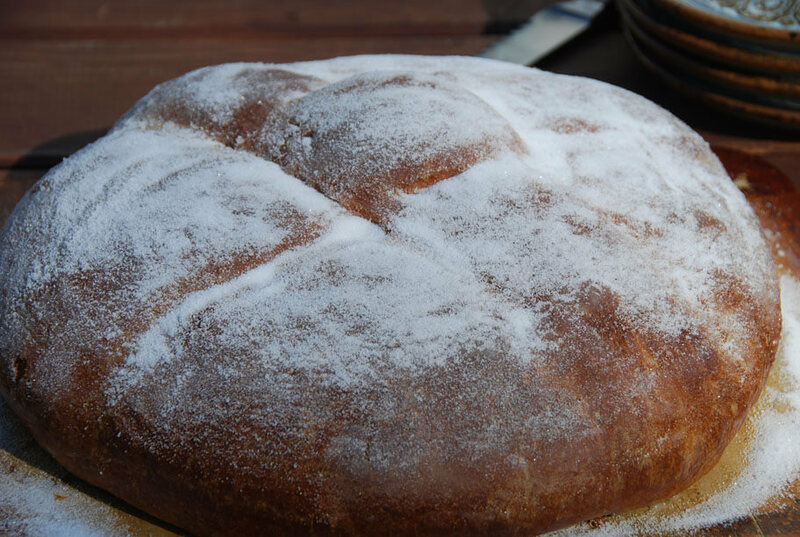 Oh for this version of pan de muerto you need eggs…. Thank you so much for this. I lost my father in 2014 and the funeral home I work at celebrates this. I always bring my dad in and set up an altar for him. I’m proud to celebrate this day with my children and my returning father, grandfather and friend. Hola Pati, when you say overnight, how many hours does that mean? Is there a minimum hours to leave the dough in the fridge? Also, is there any such thing as being too long in the fridge? This is my first try at baking pan de Muerto! Overnight is about 7-8 hours. You want to make sure it gets a nice slow rise in the fridge. You can do it, Maria! Good luck! Pati, por cierto, no recomiendo usar toalla para tapar. Mi masa se hincho tanto que quedó pegada en la toalla y fue difícil de quitar. Pati, acabo de hacer la primera tanda de pan y está horneado en este momento. Según yo, seguí tus instrucciones al pie de la letra, pero al final, salió muy pegajoso la masa y tuve que agregarle otra taza de harina para formar los panes. Es esto normal? Si Laura, porque depende de donde vives, que tanta humedad hay… a veces hay que ponerle un poco más o un poco menos. Puedo utilizar leche condensada? Gracias. I started the bread on Monday and baked it last night (Tuesday) just in time for the holiday! It tastes delicious. I love the recipe, enjoyed all the steps and lessons in patience and science. My bread decorations kind of lost their shape when it baked and the dough expanded. 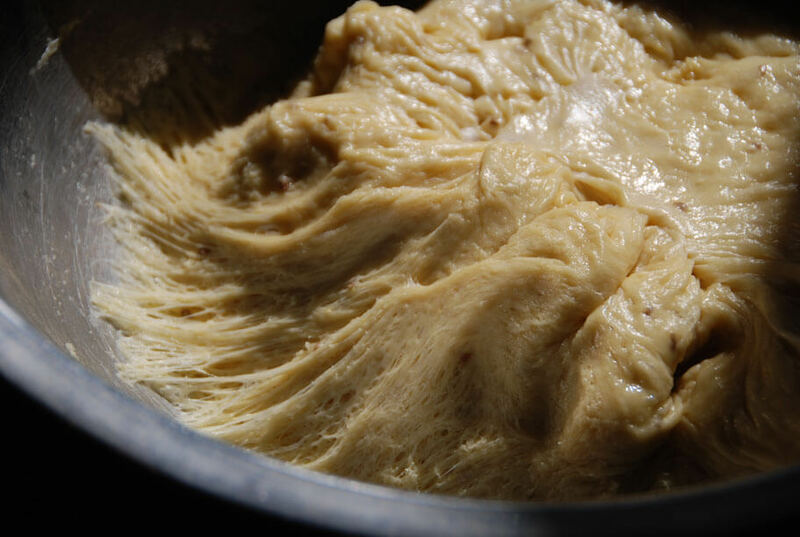 Do you have any tips for getting the dough to keep its shape once in the oven? Love your recipes I cook them often and they have seriously impressed my mexican in-laws. 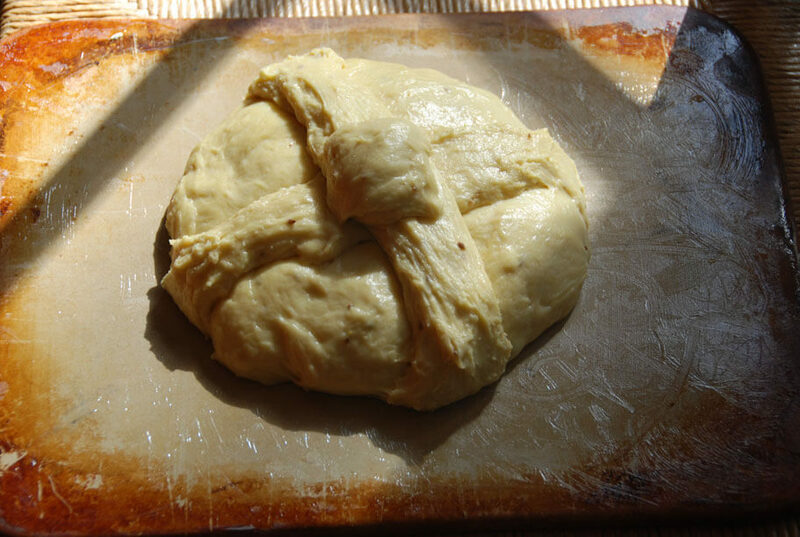 The bread is bound to change as it bakes… a bit capricious, I know! Vamos a tener todo el sitio en español en un par de semanas! Hola Pati – Queria saber si en vez de agua de naranjo, podría usar te de flor de naranjo. Gracias por tu atención. ​Hola Laura, claro, prueba con te de flor de naranjo, creo que te va a quedar también muy rico! You can absolutely mix it by hand! Thanks! I think I might have been missing more sugar at the top; I will also add nuts and dried fruits next time. Just received your cookbook today! Yay! Can’t wait to try new recipes. Thanks, great recipe, the bread rised beautifully. However, there is a slight bitter aftertaste… is it possible this is overfermented ? Could this be caused by “too much” rising time ? I let it rise for 3 hours on the second rise, it was probably 3 times the volume… have you had this problem ? Thanks! Not really, it may be the Orange Blossom Water. Otherwise, there is a kind of a bitter taste -that I really like_ that is common in yeast based breads. I just finished my bread but I think iit was not baked all the way through, I strictly followed the time and removed from the oven after 38 minutes. It sounded hollow at the bottom but when I served it doesn’t seem to be fluffy, it is somehow plastered. I believe that for the amount of dough ( which it incredibly rises and triple its size) I would increase baking time to at least 40 minutes. I am invited to bake it again next year, but I have already made my notes to adjust the baking time. Would it be a good idea to make two loaves instead of one with the same amount of dough? In that case I believe I would stick to the 35 minutes baking time. Overall it tastes good, kind of plain so I was wondering if I could also add some raisins next time? Thanks for the recipe ! Just saw your program on PBS! Loved all your recipes you prepared. I have a home in Mexico and spend about 6 months of the year there. Love the cuisine of Jalisco and Nayarit where I live. Will be purchasing your cookbook and trying them out on my husband and visitors. Thank you. Hola Debbie, I love the food in Jalisco as well! Thank you for watching & for getting my cookbook!! You will have to let me know what your family & friends think of the recipes! This is the second year I bake your Pan de Muerto. I was never very confident to bake yeast bread but I decided to give it a try after I heard your interview on NPR. 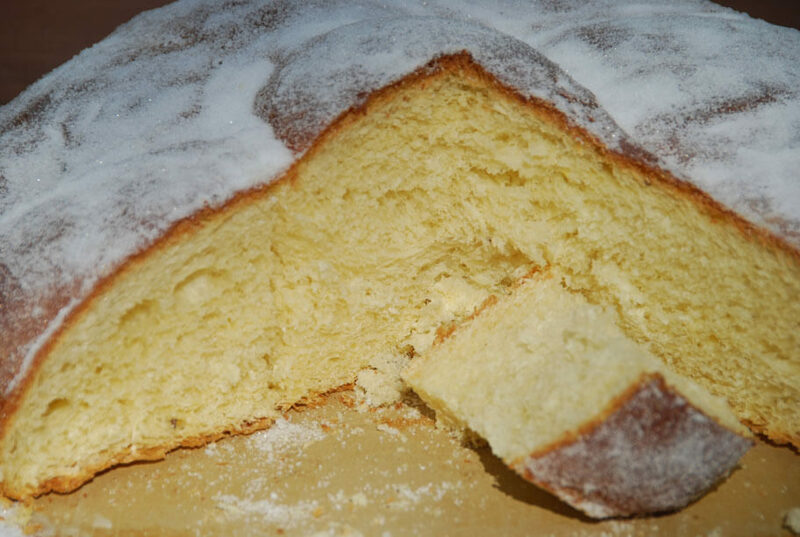 It is wonderful to have “Mi pan de muerto” here in the US. My husband loves it too. He is so much looking forward to have it that he asks at every rise if it’s almost ready. My answer is, we are one step closer…. Hola Maria, Wow! So happy to hear you both are enjoying this recipe. Thanks for making it!! Hola Rachel, I don’t knead it, but you may knead some if you feel it needs it. Let me know how it turns out! Can I use orange oil? I love everything you make, I am truly enjoying your cookbook and everyone I cook for loves it too. Hi Beatriz, If you can’t find orange blossom water, I would just use plain water. Thank you for getting my book! I have to tell you that my daughter Mia, who is 9 years old, and I love to watch your show ! We have made a few of your recipes and they never disappoint. Can’t wait to try this one ! It will be a treat for my daughter because November 2 is her birthday. Hi Martha, Thank you both for watching!! Please say “happy birthday” to Mia for me! Hi Pati, can I replace the eggs with chia? Hey Nancy, You know I haven’t tried it. If you try it and it works, let me know! Flax seeds can be used. Chia? Haven’t heard of that? Hola Pati, Could you recommend a source (website on online shop) for the little skeleton that one can bake inside the bread? The recipe says to add the milk and yeast mixture and then later says to as the starter aren’t those the same thing? I’m confused. Hola Olivia, Thank you for your message! Yes, they are the same. We corrected the recipe. The wonderful recipes just keep coming. I am excited about your new season of Pati’s Mexican Table. I cherish my Pati’s cookbook. I have tried so many recipes and they are all wonderful. Thank you for sharing. I love visiting Mexico, the people and I love knowing more about your culture. I appreciate you. Thank you so much, Judy! I hope you like the new season!! 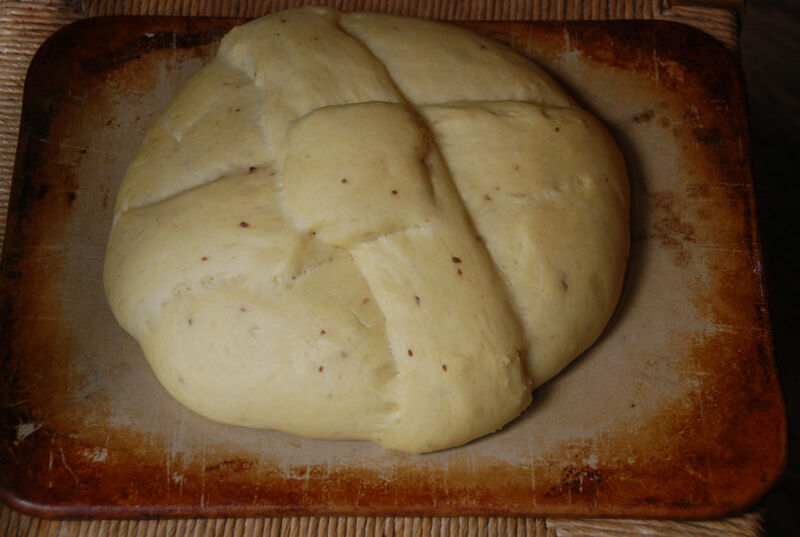 I am going to make your Pan de Muerto and have a question. I have some Orange Flower Essence on hand. How much would I use to equal the 2 TBSP of Orange Flower Water? I understand that the essence is much stronger than the water. Thanks so much for your great recipes! Sorry I may have not gotten to your comment on time! If you don´t have orange blossom water you can sub for rose petal water though it tends to be stronger. If you don´t have either, just add water instead. It will be delicious as well. I fell in love with your TV show.. although the local channel I watched your TV show on was taken out of the TV, I still come to look for your recipes. Everything is so yummy. Can’t resist getting into the kitchen without making something that you posted. Thanks so much for all these great recipes. Thank you so much for all your wonderful recipes. They’re wonderful. Keep them coming. Thank you so much, Audre!! Gracias Pati for sharing this us. I just started to watch your program in PBS Create and it really a treat and mouth watering how you prepare thiose wonderful Mexican Dishes. Roberto, Thank you so much for watching! A penas lo horneé hoy, en la noche haremosun chocolatito caliente para acompañarlo. Muy rica la receta, gracias por la explicación tan detallada, fue de mucha ayuda! No sabes la que pasé pues mi horno no prendió, tuve que cocinarlo en el horno tostador!! Jaja pero salió muy bien. Saludos!! Gracias Jocelyn, Pronto lo pondre en español.